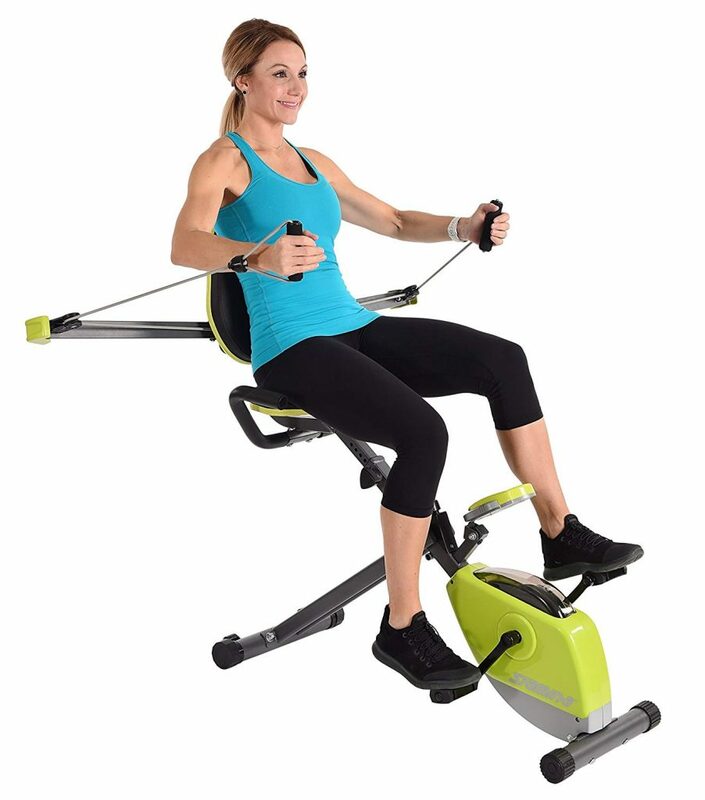 Stamina Wonder is a 2018 model modern, portable, compact, versatile and foldable 2-in-1 exercise bike at an affordable price. It comes with the elastic Wonder arms- an upper body strength system as well as two online workout videos as a bonus. It is rated 4 out of 5 stars by 11 customers at the time of this product review. The use of the elastic bands at the back for an upper body workout is optional and you can use it whenever you want at the time you’re riding the bike. It will help you burn a bit more calories and help strengthen and tone your arms and shoulders. You can actually perform different exercises with the adjustable arm angles. You can also adjust your lower body workout- bike intensity through the tension dial that you can access easily below your seat. 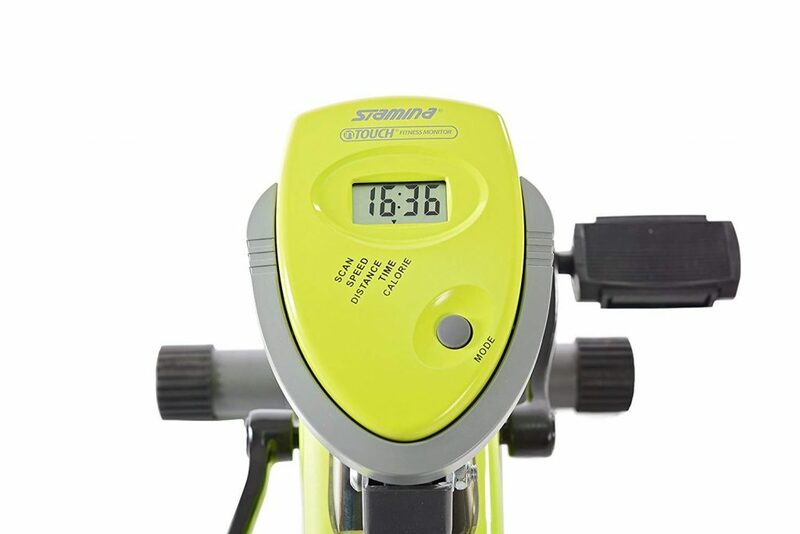 There is a small but smart and multi-functional single button LED-backlit display that shows the simple indicators of distance traveled, current riding speed, burned calories and workout time. Scan option lets you see each of these stats one by one without you pressing anything. You don’t have a heart rate reading on the display panel or the sensors on handles on this model. The cushioned large seat with the backrest is adjustable for height and seems to be very comfortable. It runs quietly and smoothly and you won’t disturb people in the house. Two online on-demand exercise videos included in the box are guided by a personal trainer that will help you achieve the results you want faster, motivating you and coaching. You’ll be engaging your legs, abdominals an your triceps, biceps, shoulders and chest muscles by doing flies, curls, high pulls, chest press and more if you use the elastic upper body bands (the smooth bungee cord and pulley) with the comfortable soft padded grips during your workout. When you adjust the angle via the adjustment knob through a wide range of motion, both arms will get to the same position or angle on both sides. Your feet can feel relatively safe, stable and comfortable on the anti-slip textured pedals without the foot straps. It has the floor end caps for more stability during your session. The Stamina Wonder Bike weighs 42 pounds with a 250 lb. user weight capacity and measures 33.5 x 8.4 x 20.7 inches- is compact in size and relatively lightweight. It can be folded easily and moved on its built-in wheels to be stored in your closet or in the corner of your room. Stamina Wonder is a compact and lightweight, foldable and versatile bike with a 250 pounds of user weight limit and it is not advised for heavier people to use it. The adjustable angle workout arms are easy to use and you’ll get both cardiovascular and resistance training. It is easy to assemble, nice looking with a modern design, adjustable and versatile, offers smooth and quiet pedaling at a low price. It is offered with a warranty of one year for the frame and 90 days for the parts. You can contact their customer support team on customer.care@staminaproducts.com if you need any help.